2.75 x 2.75 x 2" 3.75 x 3.75 x 3" 5.75 x 5.75 x 3" 7.75 x 7.75 x 3" 10 x 6.25 x 1.5" 8.25 x 4.5 x 1.5"
X-Large size Elegant Chocolate Scroll Gift and Gourmet Presentation Boxes sold by the carton. Each ribbon tie is 1-1/2" wide and around 26" in length. 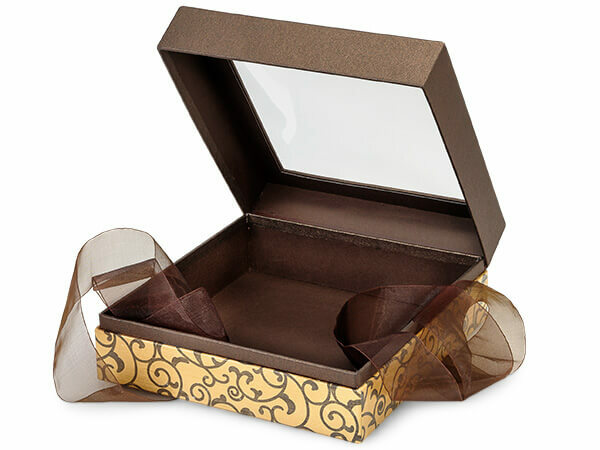 Inside dimensions are: 7.25" L x 7.25" W x 2.75" H.
These Gift & Gourmet Presentation Boxes are rigid 1 piece auto-hinged boxes with a clear acetate window in the lid. The boxes have coordinating colors both inside and out in all occasion and Christmas designs. As a finishing touch, a generous length of beautiful coordinating ribbon comes pre-attached to the bottom of the box. We recommend a food safe barrier such as a candy cup, clear cello sheet or cello bag as a bottom liner. Presentation grade packaging in exclusive designs for your gourmet products & gifts. Our boxes are ready to make your presentation beautiful, just open the attached hinged lid and add your product. Then just tie off with the attached ribbon.